This sturdy table has lots of storage space for all those books, paints and crafty bits and pieces - for one or two children. A clever re-positioning of the top storage shelf transforms this desk to allow either one or two desk positions. 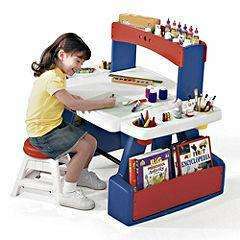 Featuring a large table surface with moulded storage tray, it's ideal for keeping art supplies neat and tidy. It includes two, 11" stools. Thanks for this great deal! It has been featured over on the HUKD blog ]Playpennies!